Fifty slaves were set free in this county previous to the 1st day of June, the period when the new law on that subject went into operation. The manumissions, how- ever, do not in most cases take effect immediately, some of them having been extended to 1870 and ’75. 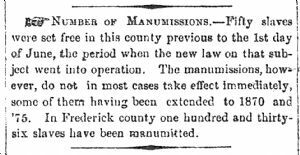 In Frederick county one hundred and thirty- six slaves have been manumitted.